Godfrey joined Dave Smith's promotion winning side on loan from Orient during a rare and brief lull in the Pilgrims' form. Although the Kennington-born winger made just 7 appearences, he gave renewed impetus to the side and his record consists impressively of 6 wins following a debut draw away at Gillingham. His single goal for Argyle was also vital, coming as the winner in a 1-2 victory against Bristol Rovers at Eastville. 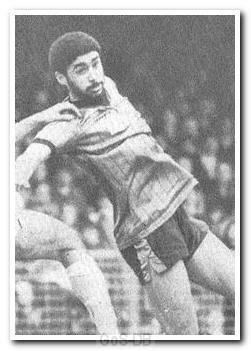 His last appearance was against Cardiff City whom he later joined on loan before returning to Orient. Godfrey spent 11 years in total at Orient before leaving permanently to join Brentford in 1988, ending his career in non-league football with Yeading in 1993.